There’s a time in every man’s life when he just needs to eat a bowl of broccoli. With pasta. It’s very unlikely that the little green tree is on many favourite food lists, but hey, it’s damn good for you. Right? Soooo… what if you could make it taste good? That’s would be win-win, surely? I thought so too. This recipe actually took us a while to get right – but it is right. ‘Why would I eat a bowl of creamy broccoli pasta?’ I hear you ask. Well, aside from the myriad health benefits (and there really are a lot) it’s really quick – perfect for those short evenings after work. It’s also filling, satisfying and has a refreshing lemon tang to it – great for summer, or at least pretending it’s summer. You can also change it how you like – its versatility is key here. 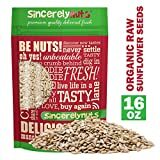 Chuck in some olives, crumble over a bit of cheese (like feta) or add some roasted sunflower seeds for a smoky, juicy addition. It’s reaaaaally easy to put together too – you can even use frozen broccoli to save time. Although frozen broccoli takes a couple of minutes longer to actually cook, you save so much time on prepping – there’s none to be done. Pro tip: don’t overcook your broccoli – not only does the texture become soft and bland but it loses nutritional power too. This page explains just about everything there is to know about broccoli – so I’ll try and put it in a nutshell (the info, not the broccoli). It contains notable levels of vitamin K, A, B1, B2, B3, B6, fibre, iron, zinc…the list goes on! Each of those is much wanted by your body, and with them come some incredible pros – cancer prevention, better cardiovascular health through lowering of cholesterol, digestive support, antioxidant help…and that’s just the beginning. Sounds like it might just be worth eating now and then. Broccoli is also a surprising source of protein – albeit as an incomplete one. It doesn’t contain all the amino acids needed to be considered as one, a bit of cheese (which is a complete source) your body can use it all together. You could also have the same effect by adding a whole grain like quinoa or brown rice. Awesome. 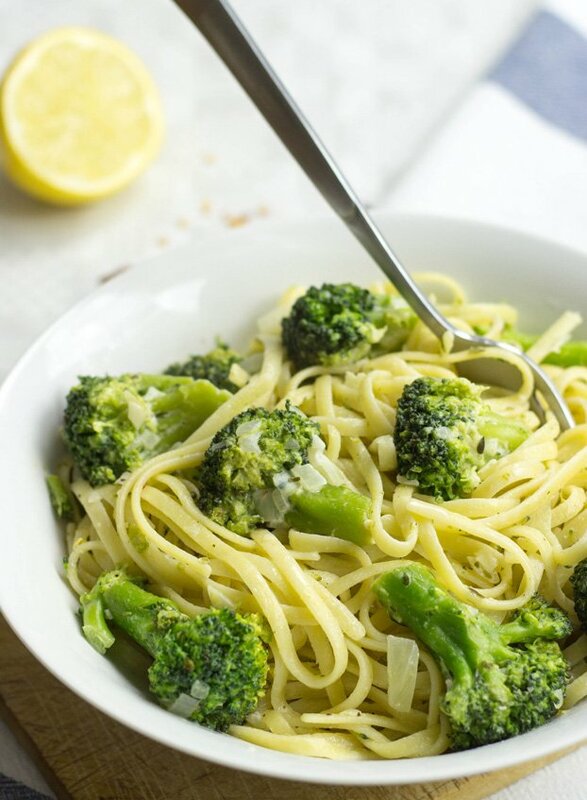 Creamy Broccoli Pasta. This vegetarian combo is a real nutrition powerhouse. 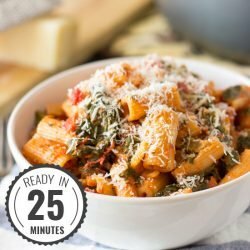 Ready in 25 minutes, super versatile, and sooooo tasty! Enjoy! Bring water to a boil and cook the pasta according to the package instructions. If you're using frozen broccoli, throw it in a pan right away with 3 tbsp of olive oil and cover with a lid - the broccoli thaws more quickly. If using fresh, wash and cut the fresh broccoli into small florets. Next, peel and dice the onion; same with the cloves of garlic. 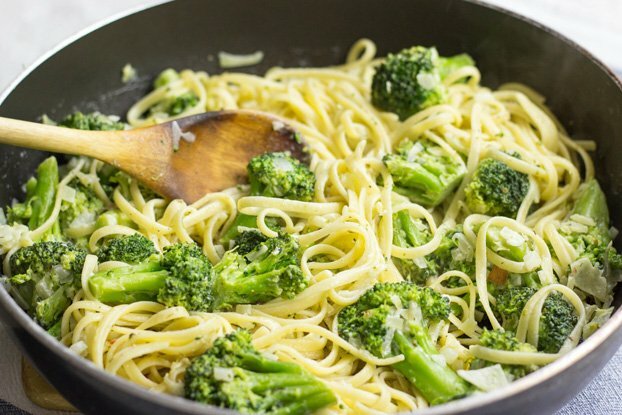 Heat up the olive oil in a pan, then add the broccoli, onion and garlic. On medium heat let everything simmer for 5 minutes. Now it’s time to add the cream cheese. Now slowly pour in the vegetable broth. NOTE: If you think the mixture is getting watery, stop pouring! Add salt, pepper and a few chili flakes to taste. To give it another kick, give a few splashes of lemon juice and a tsp of honey to the mix. IF YOU LIKED THIS RECIPE: Then check out our Tomato Spinach Pasta for a quick Italian-inspired dinner or see if this Asian style Pasta Salad with awesome peanut butter dressing floats your boat. Love that fork shot and nice idea with the cream cheese. I tend to put pesto through this type of pasta dish. I’ll give this a go. 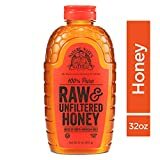 Love the spike of honey! Such a fabulous meal! I love broccoli, cooked or raw, so this recipe is perfect for me! Love the simplicity of it! YUMMMMM. 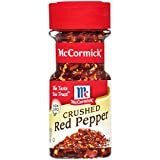 i will add this to my list of easy dinner recipes. 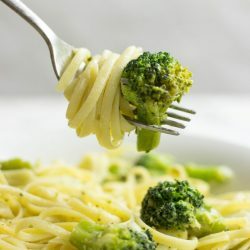 I also am a sucker for broccoli in pasta (or in stir fries), but any other way I can usually do without. Pinning! Looks so go as-is, but love your idea to toss in some olives, too! Great, easy meal! That sounds amazing. 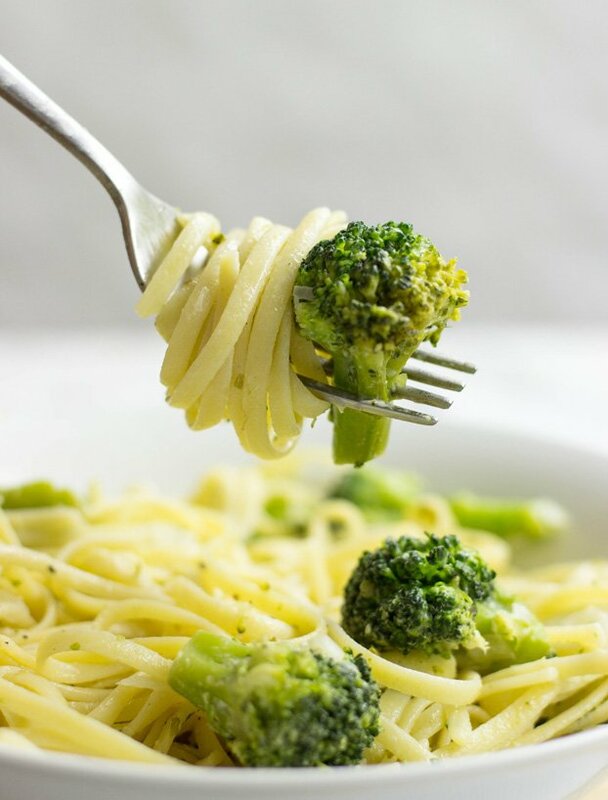 I LOVE broccoli and especially in pasta! I have been craving broccoli like crazy lately. I’ve been eating huge bowlfuls of roasted broccoli all by itself. I wouldn’t mind a huge bowl of pasta with my broccoli either. So good! But this recipe is deffo a cool way to make them tasty!! Oh this looks sooooo good. 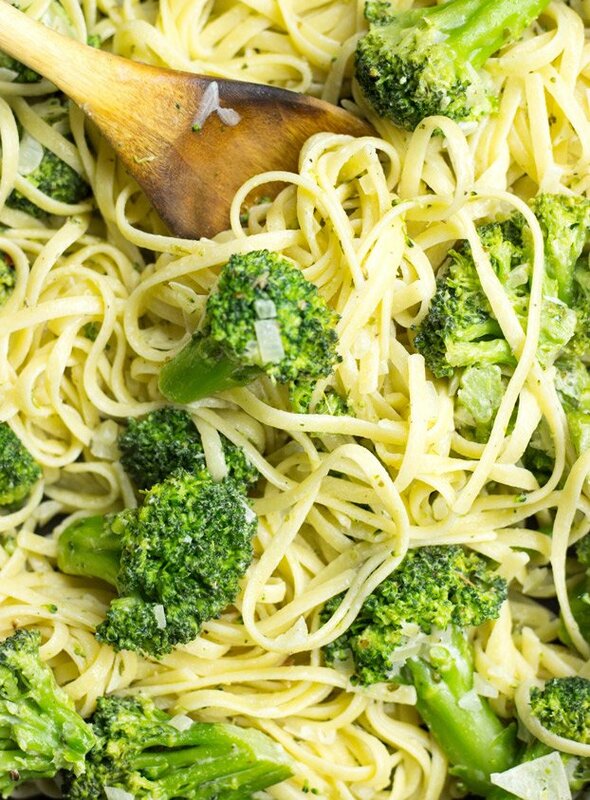 Broccoli adds just such a great flavors to pasta dishes. Great Recipe. I love broccoli. Add the creamy sauce and pasta and this is my perfect dinner. I have a friend who even eats broccoli raw as if it was a carrot. Oh dear..
You actually made this broccoli look darn good! 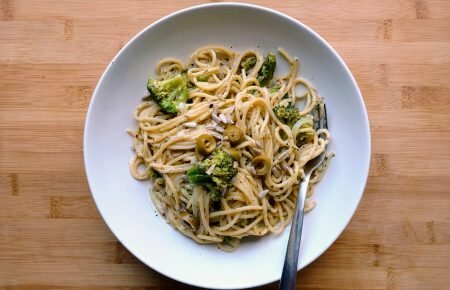 Love the creamy pasta goodness paired with a good healthy serving of veggies. A must try! Sorry but this was bland bland bland. Followed by the book, but virtually no flavour. Won’t be making again. Uhh, this hurt so much I’ll make it again this evening. Thanks for the feedback anyway! This was damn good. 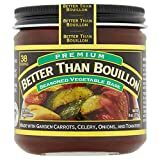 I added cayenne pepper and paprika for a little heat and smokiness and I used some trader Joe’s crushed garlic instead of fresh garlic because it has a somewhat sweet flavor that goes well with the dish. I doubled the honey to get the flavor a little more intense and I added thyme and Basil. The dish was good without my tweaks, but as a chef I just had to make it my own. Wow! I expected this to be “just OK” given the recipe is so simple. I was wrong! I added cayenne and used just a touch more cream cheese and vege stock as I wanted it to be extra creamy. And I used spiral pasta as I don’t have a pot big enough to cook lengthy pasta. Super delicious and leftovers for lunch today were just as good! This one’s definitely going to be a regular recipe for me. Cld I make it with a cheese sauce or is that th same as cream cheese just never used cream cheese b4 but wld luv to giv this a try it sounds so gd! Thinking of goin to buy th ingredients right now lol! Hi Charlie! Yep, definitely possible to make this one with cheese sauce! It’s a pretty versatile recipe and changing some parts won’t do any harm at all (in fact you can customise it to your heart’s content) :). If you haven’t tried cream cheese before I do recommend that too – the thickness of it fits really well to the recipe. Have fun! 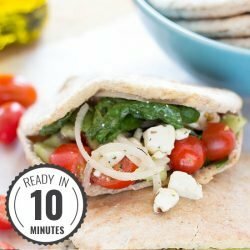 Wondering if anyone has tried using a vegan cream cheese substitution, like Kitehill? How did it work? I haven’t myself, I’m afraid. Maybe somebody else has an idea? Looks yummy but does this actually have 700 calories per portion? Hi Hannah! Yummy it is, indeed. Yep, it’s pretty much spot on 700 – the pasta, olive oil and cream cheese all add up. Olive oil is almost unbelieveably high – about 120 cals per tbsp. If you would like to cut down the calories, I suggest a slightly smaller serving of pasta and halve the olive oil. I hope that helps! That’s awesome to hear, J.J! Very pleased you enjoyed it so much. You’ve made me crave it again now, too :D. Thanks for writing! My husband pulls a face everytime I say we’re eating broccoli (which admittedly is fairly often as it’s so good for you). Anyway, because he’s not a big greens fan, I try to come up with many new recipes that include a lot of greens but don’t taste boring. This recipe he really really liked. He still pulls a face when I say I’m making it, but while eating he has a very happy face lol. Long story short, this is a great recipe. It’s stupid simple when I’m not in the mood for an houe of cooking, but it’s super delicious and really tastes like a lot more than goes into it. I’m a fan! I’m thinking of making this as a side dish for a luncheon I am hosting on Friday but would like to make it vegan. Do you think vegan cream cheese would work just as well? Hi Amber, I would say that as long as you like the flavour of your vegan cream cheese then it will be absolutely fine to sub it in. Enjoy the luncheon!